Welcome to the first He Said/She Said Beer Review. The goals of He Said/She said are to have a beer reviewed by both a male and a female. For the first few, I may be reviewing them with family or friends, but I hope eventually to have local beer people doing the He Said/She Said reviews. Occasionally we’ll have someone who doesn’t drink a lot of craft beer, sometimes we’ll have someone who only buys craft beer, and sometimes we’ll have major beer nerds. It will hopefully be a good mix of different ideas. I hope you enjoy the format, and if you want to do a review, please get in touch. 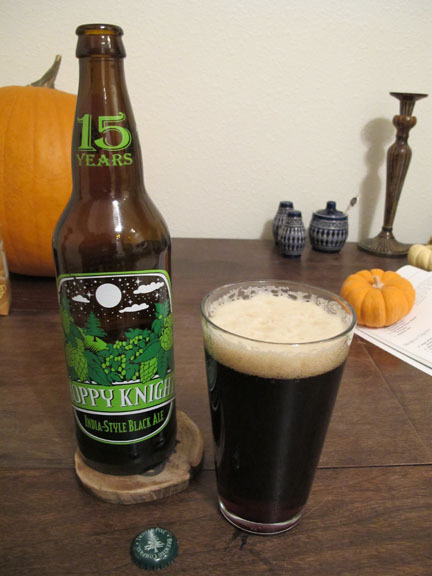 For tonight’s review we are tasting Twisted Pine’s Hoppy Knight, classified as a Black IPA, or a Cascadian Dark Ale, if they used Pacific NW hops. Twisted Pine is located in Boulder, CO and their beer should be available in Colorado Springs at Coaltrain’s or at Spring’s Liquor Outlet. These both should carry Twisted Pine beers, so maybe try calling them to see if they’ve got Hoppy Knight. The smell is very hoppy! Nooo! It’s extremely dark in color and the head is really nice and stays a while. “I probably won’t like it,” she says. She goes to drink it and quickly decides the hops are too much. It’s easy to drink though, and not as thick as expected, it looks like a porter or stout, but it doesn’t come across as one in texture. She can’t tell if the aroma and flavor are roasty, but she thinks so, it’s just really masked by the hops. She does not like the Twisted Pine as much as a porter and couldn’t drink a whole lot of it, but there were characteristics, such as the lightness of the beer that were better than a porter. She says it’s definitely a well crafted beer. For tonight, “He” is me…and “he” really enjoys almost all beers. He does consider himself a beer nerd. His favorite style changes a lot, but currently it’s probably vegetable and spice beers and Farmhouse ales. He is currently a bit burnt out from IPA’s and his least favorite styles are Barleywines and Dopplebocks, but that could change any minute.